SANDY — A sellout crowd of 20,295 couldn’t cheer Real Salt Lake to victory, but those fans were treated to a night of great soccer in a 1-1 draw between RSL and the New York Red Bulls. RSL coach Jeff Cassar wasn't satisfied with earning just one point in the last game of his team's homestand, but he was pleased with his players' effort over 90 minutes. “I thought attacking-wise we were very good,” said Cassar. “I really thought we played good on both sides of the ball, and I really couldn’t ask for more from our players. 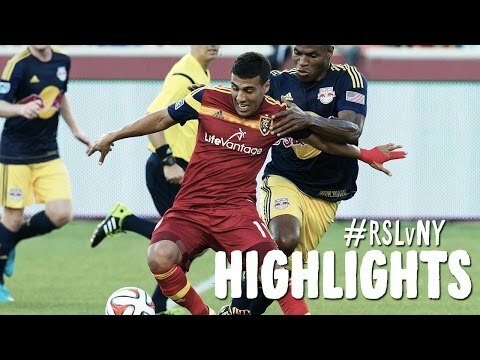 Joao Plata put RSL on the board in the 18th minute, beating Red Bulls 'keeper Luis Robles at the far post to tally the striker's ninth goal of the season for the Claret and Cobalt. The play was initially set up by a Javier Morales corner kick that New York failed to clear from the attacking third of the pitch. Morales corralled the ball and dribbled across the 18-yard line before getting off a shot that was redirected by Chris Shuler and deflected away by Robles' leg. Defender Chris Wingert collected the deflected shot on the edge of the box, and found the waiting boot of Plata, who cleanly buried the ball into the side netting. RSL took the 1-0 lead into halftime, poised to bunker down for the full three points at Rio Tinto Stadium. All seemed quiet early in the second half, as RSL paced itself to hold onto the one-goal lead and secure the shutout at home. That was until the 58th minute, when the Red Bulls struck on a goal from superstar Thierry Henry. The captain Henry took a touch pass laid off by fellow Red Bull Tim Cahill from just outside of the box, and was able to beat a diving RSL goalkeeper Nick Rimando with a laser beam into the back of the net. "Sometimes it looks like he's not interested, and then boom," Cassar said of Henry. "He can strike at any moment." Fellow defender Nat Borchers also took note of the Red Bulls crowding the space in front of himself and central defender Chris Schuler in the buildup to the equalizer. RSL got another look at goal in the 71st minute on a corner kick from Plata. Schuler got his head on the ball from the Plata service right in front of goal, but the effort was parried away by Robles and subsequently cleared by New York. In the final minutes of extra time, substitute Robbie Findley couldn’t fully connect with a cross into the box and his header on goal was easily collected by Robles. RSL has a quick turnaround this week, with a Rocky Mountain showdown set to kick off in the colorful state of Colorado Saturday night.